Juice wheatgrass, Juice fruits and vegetables, Make 3 types of pasta, Frozen desserts, Soy milk, Homemade baby food, and Delicious nut butters. No heat generated as in other juicers, all of the enzymes are preserved for a fresh and 'live' tasting juice. Easy to clean - Takes half the time versus cleaning other brands. No internal screen To clean or get clogged. 8-Year Warranty on its motor and 1-Year Warranty on parts. You also have the option to have your juice with or without the additional fiber that the pulp provides. Higher Power The motor has average, but adequate power, and should perform a sufficient job on most foods that it's designed for. Motor Warranty 8 Years When compared to other juicers, this appliance has an average limited motor warranty. The motor warranty is a good indicator of motor durability. 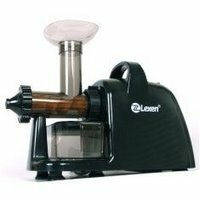 Star Rating 4.5 User reviews, ratings, and feedback indicates that this juicer is rated higher than average by 17 users and ranks in the top 19% of juicers.